Recent news, analysis, and commentary on special operations, national security, and current conflicts. BUD/S Rock. 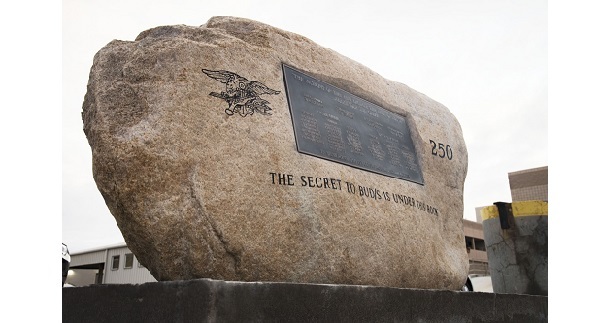 A gift, in the form of a large boulder, from the students of Basic Underwater Demolition / SEAL (BUD/S) Class 250 sits in the parking lot at the Naval Special Warfare Center. Inscribed on the rock is the phase “The Secret to BUD/S Is Under This Rock”. The BUD/S class, graduating in 2004, secretly moved the rock from an unknown location to the NSWC parking lot. Find out more in “This Story is About a Rock”, NSWC DVIDS, January 25, 2019. New Sniper Rifle. Barret has built the MRAD for the Special Operations Command Advanced Sniper Rifle program. (Military Times, Jan 24, 2019). 10th SFGA DFAC Steps Up. The 10th Special Forces Group dining facility at Panzer Kaserne began offering free meals to members of the Stuttgart military community not getting paid because of the government shutdown. (Stars and Stripes, Jan 25, 2019). Top Rescue Squadron. The “That Others May Live Foundation Rescue Squadron of the Year in 2018″ has been awarded. Read “79th RQS Awarded Top Rescue Squadron of 2018”, DVIDS, January 25, 2019. SF Officer Heading to Trial. A Special Forces Major will be in court soon. Major Jason Sartori faces six counts of assault as well as other charges. His Special Forces tab has been revoked. (Army Times, Jan 25, 2019). Polish SOF to Get Helicopters. Four Black Hawk helicopters – the export model – are heading to Poland in 2019 for use by its special operations forces. The four S-70i Black Hawks will be used by the Polish Special Operations Component Command or POL SOCC. (Defence 24, Jan 25, 2019). Bolduc on Leadership. Retired BG Don Bolduc, an SF officer, provides his perspective on leadership in “A Leader’s Playbook”, Small Wars Journal, January 27, 2019. SEALs Granted Immunity for Testimony. Seven former teammates of Navy SEAL Gallagher will be testifying for the prosecution in the upcoming trail. Gallagher is alleged to have murdered a wounded ISIS combatant held prisoner by stabbing him in the neck. (The San Diego Union-Tribune, Jan 25, 2019). Navy Officer Charged. The Navy officer who supervised Navy SEAL Gallagher in 2017 has been charged with various offenses tied to the case. (Time.com, Jan 22, 2019). MACV-SOG’s CAR-15 Rifle. Former Special Forces soldier (and now author) John Plaster writes about the history of the CAR-15 rifle carried by members of Military Assistance Command Vietnam – Studies and Observation Group during the Vietnam war. Read “Behind Enemy Lines With the CAR-15 Rifle”, American Rifleman, January 24, 2019. Bowdoin College Remembers Jon Farmer. Green Beret Jonathan Farmer was killed in action in Syria on January 16, 2019. He was a graduate of Bowdoin College in Maine. His death did not go unnoticed by the college. (Bowdoin Orient, Jan 25, 2019). SF on Firebase Kate – Vietnam. A small Special Forces camp on a hill top along the Cambodian border was a magnet for enemy activity. The base was surrounded by the enemy, the only road to the base was controlled by the North Vietnamese Army (NVA), and resupply could only be done by air. One morning the base was attacked by enemy forces – attackers outnumbering defenders by 40 -1. Eventually the SF team and its force of indigenous fighters (about 100) abandoned the camp – moving overland through the jungle to a nearby SF Camp. The young SF team leader – Captain William Albarht – would earn three Silver Stars, three purple hearts, and five Bronze Stars during the Vietnam War. Read more of his story. A documentary of the event is available on Amazon.com. Watch the 2-minute long trailer. Black Hornet PRS for Army. FLIR Systems has been awarded a $40 million order to deliver Black Hornet Personal Reconnaissance Systems (PRS) for the U.S. Army. The nono-UAVs will be integrated into the force. (Defence Blog, Jan 25, 2019). OSUT Extended for Army. The Army’s experiment with extending basic training for the infantry has apparently succeeded. The Secretary of the Army signed off on extending basic for infantry soldiers from 14 weeks to 22 weeks. The training for armor and cavalry recruits may also get extended in the future. (Stars and Stripes, Jan 24, 2019). Army CoS Says Readiness Improving. General Mark Milley addressed the Association of the U.S. Army recently and had some positive news on improvements to the U.S. Army’s readiness. He says units are coming up to strength in manning, the percentage of ‘nondeployables’ is going down, and tactical combat skill levels are improving due to better initial training for recruits. (Army.mil, Jan 16, 2019). Loitering Munition Drones. Technology continues to advance many aspects of warfighting. One of advancements is the development of small drones carrying munitions that can loiter over a battlefield for several hours and then home in on a target to destroy it. Read “The Ultimate Weapon of War No One is Talking About”, The National Interest, January 25, 2019. CT, CVE, Gender, and Masculinities. Rebecca Turkington and Catherine attempt to advance the argument that “addressing masculinities” and “offering an alternative path to manhood” could go a long way to eliminating violence, conflict, and wars. Hmmmm. Read “Gender, Masculinities, and Counterterrorism”, Council on Foreign Relations, January 23, 2019. CIA’s Tony Mendez. A legendary Central Intelligence Agency officer has passed away. He won the CIA’s Intelligence Star for his masterminding and execution of the 1980 rescue of six American diplomats from Iran. After I read the news this past week about his death I watched Argo again, for the second time; then did a little bit of internet research to see where the movie strayed from actual events. It is always interesting how Hollywood will ‘fix’ the plot to make it more exciting when the real events are sometimes more dramatic. Read more in “Honoring the Legendary Tony Mendez”, CIA, January 23, 2019. ISIS – Far from Defeated. Michael Mooney, a retired U.S. Marine Corps colonel and national security guru, comments on the never-ending war with the Islamic State. He discusses the nature of revolutionary warfare theory and how it applies to ISIS. Read “Ending Endless Wars and the Islamic State”, Small Wars Journal, January 25, 2019. Mercenary Business is Booming. The use of private military corporations has grown over the past few decades. One former ‘contractor’ writes on the pros and cons of using mercenary forces in “Outsourcing War to Mercenaries Is a Lousy Idea: Ex-Mercenary”, by Sean McFate, Daily Beast, January 26, 2019. U.S. – Philippine Alliance. It appears that the 1951 Mutual Defense Treaty (MDT) between Washington and Manila is now under review by the Philippines. While the treaty itself may not be in jeopardy it seems the Philippines is looking for some clarification from the U.S. regarding the application of the treaty to the South China Sea. This, of course, has lots to do with Beijing’s illegal claims and militarization of the South China Sea. The authors of this article believe that action is needed to enhance the overall Indo-Pacific strategy of the U.S. Read more in “Time to Make Good on the U.S. – Philippine Alliance”, War on the Rocks, January 21, 2019. Church Bombings in Philippines. Twenty people were killed and over 100 wounded in two bombings outside a Roman Catholic cathedral on a southern Philippine Island during a Sunday Mass on January 27th. (VOA, Jan 27, 2019). Russian Contractors in Venezuela. The political situation is heating up in the South American country rich in oil but with a depressing economy. It seems there are now ‘two presidents’, violent street demonstrations are frequent, U.S. embassy is at reduced staffing, an occasional weak attempt at a military coup, and now . . . the Russians are milling about that troubled country. It appears that as many as 400 Russians – possibly linked to the Wagner Group – present. Read more in “Reports: Russian Military Contractors Operating in Venezuela”, Radio Free Europe, January 25, 2019. Venezuelan Military Officer Defection. The country’s military attache at its Washington embassy to the United States defected on Saturday (Jan 27th) from the government of President Nicolas Maduro. See “Top Venezuelan Military Envoy to US Defects”, Voice of America, January 27, 2019. Colombia’s PMCs. Diego Lynch provides us with a detailed article about Colombian private military corporations making money in the Middle East and elsewhere. See “The rise and dominance of Colombia’s private military contractors”, Lima Charlie News, January 4, 2019. Backgrounder – U.S. Military Operations in the Sahel. The Department of Defense has been shifting away from counterterrorism (CT) operations around the world to focus on the ‘big wars’ with near peer competitors. However, the U.S. military still has a footprint conducting a variety of missions to include CT, Security Force Assistance, and more. This footprint will be reduced over time with the strategic shift (CT to the big wars). One place where this shift will take place is in the Sahel region of Africa. Annika Lichtenbaum provides an informative article on the terrorist / insurgent groups operating in the Sahel / Lake Chad Basin regions, what the U.S. military is doing in this region, and what the future might bring. Read “U.S. Military Operational Activity in the Sahel”, Lawfare Blog, January 25, 2019. Somalia – No More Body Counts. U.S. Africa Command will no longer be providing body counts of dead al-Shabaab fighters killed during airstikes in Somalia. The latest report with the number of deaths stated that 52 al-Qaeda-linked extremists were killed in mid-January. See “US No Longer Announcing Deaths, Damage in Somalia Airstrikes”, Voice of America, January 24, 2019. Mali Heating Up. The United Nations mission in Mali has been taking some hits. A recent IED attack killed two UN peacekeepers from Sri Lanka. US / Russia Naval Activity Picking Up. Russian and US navy ships are actively shadowing each other in the Baltic and Black Seas. (Defense One, Jan 24, 2019). Albania and NATO. The West and Russia are attempting to gain influence in the western Balkans – at the expense of each other. NATO is enhancing its presence in Albania through a variety of methods – to include modernizing an air base in central Albania. Read “NATO footprint in Albania to grow with construction projects at former Soviet air base”, Stars and Stripes, January 26, 2019. Syria. Apparently the announced withdrawal of U.S forces from Syria will not be ‘complete withdrawal’. The U.S. intends to maintain a small force at al-Tanf – a Syrian city near the tri-border area of Syria, Jordan, and Iraq. Al-Tanf also sits on a major highway connecting Iraq to Syria that leads on to the capital of Syria (Damascus). This base is considered a “critical buttress for combating Iranian influence in the region” as it sits on a potential Iranian ground supply route through Iraq to Syria. A U.S. base at al-Tanf would negatively affect the establishment of a “Shiite Crescent”. The U.S. claims at 55-kilometer exclusion zone allowing the U.S. to strike any non-friendly forces moving through the area. There are approximately 200 Americans at the base working with Syrian local forces who are fighting Islamic State fighters and maintaining local security. (Foreign Policy, Jan 25, 2019). Conflict Between Arabs and Kurds. U.S. Army Colonel (Ret) Norvell DeAtkine examines the age old clash between Arabs and Kurds in an informative and detailed article. Read “Arabs and Kurds – Why can’t they just get along?”, Lima Charlie News, January 25, 2019. Prince of War. Erik Prince will be the main topic of a new film coming out soon. The script is based on Prince’s 2009 book Civilian Warriors and a 2009 Vanity Fair article entitled “Tycoon, Contractor, Soldier, Spy”. (Variety, Jan 23, 2019). Strike Back – by Cinemax. I must be spending too much time on the internet and not enough watching the tele. Seems there is an action series on Cinemax called Strike Back that is heading into its 7th season. Read an article that describes how the actors get authenticity into the script and watch a 2-min long trailer. Exercise Emerald Warrior 2019 CSAR Training, 127th Wing PA DVIDS, January 22, 2019, 2 minutes. The Emerald Warrior exercise is a major event for the SOF community as well as other units of the various services. The U.S. Special Operations Command sponsors the two-week joint combined tactical exercise. Watch this video of Airmen conducting Combat Search and Rescue training. Video – C-146 SOFME Flight. Watch a 3-min video of a Special Operations Forces Medical Element aboard a C-146 train on medical procedures in flight. (27th Special Operations Wing, DVIDS, Jan, 8 2019). Video – Technology doesn’t win wars. Why the US pretends it does”, Big Think, January 27, 2019. Dr. Sean McFate, a foreign policy guru, provides his perspective on the wars of the future in this 8-min video. It is hard to agree on everything he says but he raises some valid points. Photo: BUD/S Rock – gift from class 250 at NSWC. Navy photo by Mass Communication Specialist 3rd Class Devin Monroe, Jan 17, 2019, NSWC.